The recent spate of violent military crackdowns on civilians in Egypt has caused the Obama administration to begin reevaluating aid to Cairo as a way to influence the situation there. 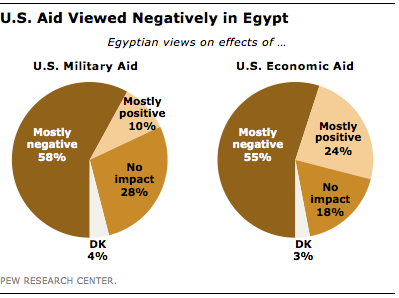 While the American public opposes continuing military aid to Egypt, it may be surprising to note that the Egyptian public also has taken a largely negative view of U.S. military and economic aid. According to a March survey by the Pew Research Center’s Global Attitudes Project, a majority of Egyptians (55%) believe that U.S. economic aid to Egypt is having a mostly negative impact on the way things are going in their country and another 18% say it is having no impact at all. Only about a quarter of Egyptians (24%) regard this assistance positively. In the same vein, fully 58% of Egyptians think American military aid to their country is having a negative overall impact, while more than one-in-four (28%) believe it has no influence. These views are largely unchanged from 2012, when 61% of Egyptian citizens viewed military aid negatively and 25% thought it was having no effect on the direction of their country. Only 10% currently have a positive opinion of U.S. military assistance, similar to the 11% registered in 2012. Negative attitudes about U.S. aid to Egypt are also prevalent here in America, according to a new report released Monday by the Pew Research Center. The national survey found that 51% of Americans say it is better for the United States to cut off military aid to Egypt in order to put pressure on the government amid the continued violence plaguing the country.